This is a true forecast, predicting what the result will be on the 8th of June. All our previous forecasts have been NowCasts, indications of the result if the election had taken place on the day of the forecast. Why have you moved to a proper forecast? – From around a week out to the election, the levels of uncertainty around the final result begin to diminish. From today we can project forward to Thursday 8th and make much firmer predictions about where the final voting figures will be. Will your forecast change between now and next Thursday? – Very likely. If a week is a long time in politics, it is an eternity in elections. We will see lots of opinion polls published between now and next Thursday and these will help us to tune our forecast and to identify any major changes in trends which we will reflect. The overall summary of our forecast is “Modest Gains for the Conservatives”. The race continues to tighten as we approach polling day. 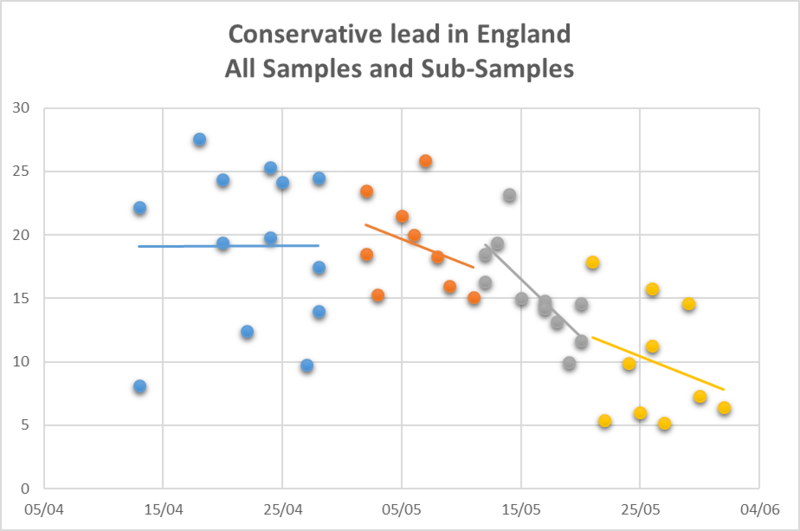 Opinion polling evidence indicates that whilst the Conservative lead is still falling, the rate of closure of the gap has slowed down. We have had one poll in the last few days that shows the gap widening again, but there is no sign of a general trend in this direction. Our forecast in Wales shows a level of conservatism on the outcome for the Conservatives. We are now more confident that the Conservative will make gains in Scotland. ← Is Labour’s support coming from the 2015 “Others”?